An NBC Bay Area investigation reveals 1.2 million animals, including endangered and threatened wildlife, were killed abroad by American hunters and sent to the U.S. as trophies over the last 15 years. American hunters abroad routinely kill endangered and threatened animals for sport, and then ship the wildlife home to the United States to be mounted as trophies, according to federal records obtained by the NBC Bay Area Investigative Unit. The high-priced hobby, known as trophy hunting, is legal and supported by some scientists because of its financial contributions to wildlife conservation. However, wildlife advocates and a former top U.S. official are raising questions over America’s ability to vet trophy hunting programs abroad, before determining whether certain trophy shipments should be granted approval to enter the United States. Poachers, critics say, are often able to capitalize on the lack of U.S. oversight by posing as legitimate trophy hunters abroad when they are actually killing endangered and threatened wildlife to sell on the black market back in the United States. "Major wildlife populations, iconic populations – elephants, rhinos – are being decimated by sophisticated international syndicates that are taking the wildlife products – the rhino horn, the ivory and the tiger bone – and are selling them globally," said David Hayes, a former Deputy Secretary of the U.S. Department of the Interior, who oversaw the regulation of sport-hunted trophy imports under President Clinton and President Obama. "It’s a huge market." The controversy surrounding sport-hunted trophies gained national attention in July, when a Minnesota hunter used a bow-and-arrow to kill Cecil, a well-known lion in Zimbabwe. While Cecil’s death sparked outrage in the United States, federal records obtained by the NBC Bay Area Investigative Unit show that during the same month Cecil was shot, U.S. hunters legally killed 69 other lions in Africa to mount as trophies back at home. "The problem with trophy hunting is that in many cases it inspires unethical and sometimes illegal behavior on the part of hunters, and that’s what happened to Cecil the Lion," said Michael Sutton, a former federal wildlife inspector and past president of the California Fish and Game Commission. "That reflects poorly on all hunters, not just trophy hunters." Each year, American hunters shoot and kill more than 70,000 animals abroad for sport, and then ship the wildlife to the United States as trophies. The practice is legal, even though some of the animals are considered to be particularly vulnerable. 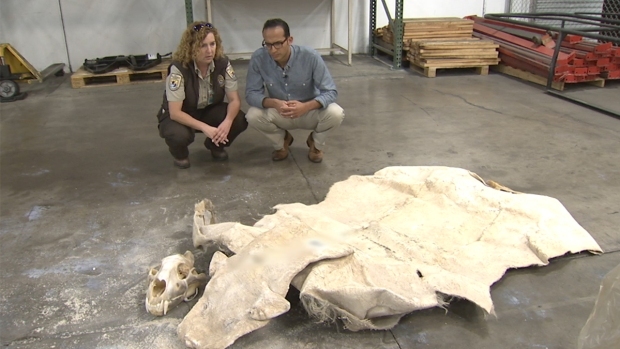 In fact, the Investigative Unit found endangered or threatened animals are imported into the United States as trophies nearly every other day; they enter the Bay Area almost weekly. At least 1.2 million sport-hunted trophies have been legally imported into the United States over the past 15 years, according to 25,000 pages of data obtained from the U.S. Fish and Wildlife Service. "I think if it’s out there, somebody, somewhere has shot it and I’ve seen it," said Ann-Marie Holmes, a supervisory wildlife inspector for the U.S. Fish and Wildlife Service. What's a Lion Look Like Before Becoming a Hunting Trophy? Ann-Marie Holmes, supervisory wildlife inspector for the U.S. Fish and Wildlife Service, speaks with Bigad Shaban about a recently imported lion trophy. Holmes oversees inspections at the port of San Francisco, one of more than 60 U.S. ports that have received sport-hunted trophy shipments over the past 15 years. Holmes spoke to the Investigative Unit from one of her posts inside a non-descript warehouse near San Francisco International Airport. 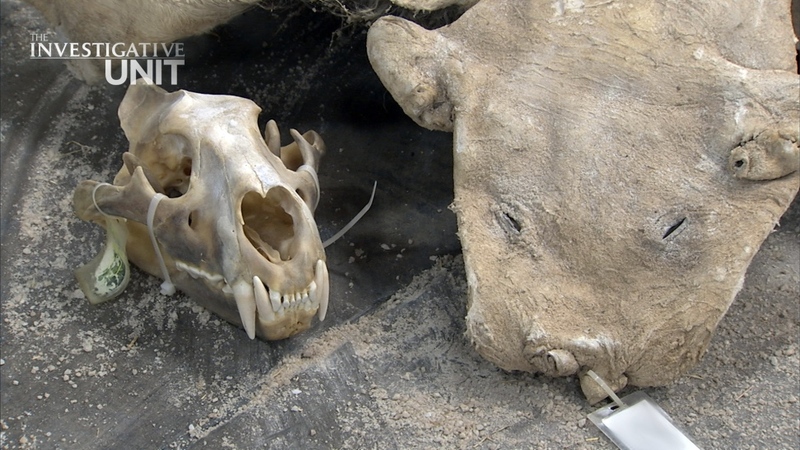 Tucked in one corner of the building, are dozens of crates containing the skulls, horns, and dried pelts of some of Africa’s most sought after animals. A team of inspectors routinely check incoming shipments to ensure the contents match the accompanying hunting permits. "There’s only four wildlife inspectors for the whole part of San Francisco, Oakland, and San Jose, so we have to use our time wisely," Holmes said. Inspectors check about 50 percent of incoming trophy shipments, according to Holmes. Their decision on what to inspect is often based on the shipment’s accompanying paper work and, sometimes, personal intuition. "Prior knowledge, maybe, of the importer of record, prior intel on maybe the country that it’s coming from," Holmes said. "We do get intel alerts regarding certain situations." Since 2010, the federal government has documented 2,963 violations relating to the import of sport-hunted trophies into the United States, according to records obtained from the U.S. Fish and Wildlife Service. About 96 percent of those cases have been closed; as a result, 14 people had to serve time in jail and 546 violators had to pay criminal fines, ranging from $25 to $390,700. About 54 percent of the listed infractions concerned violations of the Endangered Species Act. "We have found skins rolled up in other skins, where they are just attempting to hide things," Holmes said. During our visit with Holmes in San Francisco, inspectors came across two crates containing lion trophies. The hides were covered in pesticides to keep them from rotting in transit. Lion trophies are common in the Bay Area, according to Holmes, and usually arrive at the Port of San Francisco about once or twice a week. The federal government proposed listing the species as "threatened" last October, but since then, American hunters have killed at least 601 lions for trophies, according to records obtained by the Investigative Unit. The United States allows the import of wildlife trophies from foreign countries, even if the species population is declining, if the country’s government can prove their trophy hunting is run in connection with wildlife conservation programs that work to strengthen the overall species. Lions are found in most countries of sub-Saharan Africa, but a relatively small population of the species also lives within the Gir National Park in India, according to the International Union for Conservation of Nature. The wildlife advocacy group estimates there are only as few as 23,000 lions remaining in Africa, which represent a 43 percent decline in population over the last two decades. While killing an endangered or threatened species may offend animal lovers, many wildlife conservationists and scientists view the trophy hunting industry as a vital financial tool to fund conservation programs. Across Africa, trophy hunting is estimated to bring in $200 million annually, according to a 2009 study by the International Union for Conservation of Nature. "To me, when I go out hunting, I’m part of nature," said Geoffrey Vassalo, a hunter and taxidermist based just outside of San Francisco. "Hunting protects these populations, maintains these populations, without hunting they will disappear." While hunting rules and fees vary species-to-species and country-to-country, hunting permits can be costly. Proponents of trophy hunting say that money fuels conservation. Killing a single lion can cost a hunter up to $71,000, when you include trophy fees and the price of a several-day safari, according to a 2012 study, funded by Panthera. Can Killing Animals Help Protect the Species? Animals considered threatened or endangered are not necessarily off-limits for American hunters looking to kill animals abroad and import them into the United States as trophies. "You’re going to have a lot more paperwork and go through a lot more steps to be able to get those permits to bring it in," Holmes said. In examining federal records from the U.S. Fish and Wildlife Service, the Investigative Unit found that endangered and threatened animals are shipped to the U.S. almost every other day. For those types of vulnerable species, it is U.S. policy to only issue import permits to countries that can prove their trophy hunting is combined with effective conservation programs to help improve wildlife populations. "There can be situations where in a given area, there are simply too many animals," said Hayes, a visiting professor at Stanford Law School, who spent 6 years overseeing the regulation of trophy imports as Deputy Secretary of the Department of the Interior. "Even if you have a population, range-wide, that is threatened and is not that vigorous, in a given area, you may have a sub-population that is too large for the carrying capacity." Killing older, weaker, or more aggressive animals can prove beneficial, even for a struggling species, according to wildlife biologists. Critics, however, are quick to mention that it is not often feasible for hunters to identify those types of animals before pulling the trigger. A close-up view of a lion’s paw from a sport-hunted trophy recently imported into the Port of San Francisco. Hayes admits effectively monitoring conservation plans in foreign countries can be challenging for the U.S. Fish and Wildlife Service, and raises questions about the agency’s ability to fully vet trophy hunting programs abroad. "It’s tough," he said. "It’s tough because these are Fish and Wildlife Service biologists sitting here in the United States, making decisions about what’s going on over in Africa." Hayes says poachers attempt to take advantage of the limited oversight by routinely using trophy hunting as a front to be able to kill wildlife and profit from it on the black market. Just last year, the agency suspended the import of sport-hunted elephant trophies from Zimbabwe and Tanzania, citing a lack of information to prove that the programs "enhance the survival of the species." "There was evidence that under the guise of a hunting concession, international traffickers were coming into the country that was covered by its concession and wiping out elephants," Hayes said. "There was no sport hunting involved. It was essentially a massacre of elephants that was occurring." Hayes said with a limited staff, it is possible the U.S. Fish and Wildlife Service could be missing other infractions abroad. "Oh, it’s certainly possibly," Hayes said. "Yes. Sure." Top officials with the U.S. Fish and Wildlife Service declined interview requests, but did provide an emailed statement. "Although we do not do site visits as a regular practice, we occasionally visit countries in person to verify information received," the statement read. "We also regularly attend technical meetings related to particular species, conservation programs, sport hunting, etc. We also have an extensive network of contacts in the NGO (non-government organization) and scientific communities, government agencies, etc. that provide information to us for consideration." According to the agency’s statement, the U.S. Fish and Wildlife Service receives thousands of permit applications each year. "Most permit applications are relatively straightforward, while others, such as for the import of sport-hunted trophies of CITES [Convention on International Trade in Endangered Species] Appendix-I and ESA [Endangered Species Act]-listed species are more involved," the statement read. "We do everything we can to fulfill our legal obligations and make required findings with the resources available to us. We are currently in the process of reviewing our permit fee structure and plan to propose changes to our permit fees to more accurately reflect the resources required to make these findings." Poachers take some bizarre steps to illegally sneak their hunting trophies into the United States. Sutton, who served as a federal game warden for six years, is an avid outdoorsman and hunter, but said it is time for the government to consider banning trophy hunting, and questions whether the money it generates always flows into legitimate conservation programs. "That could be an important source of revenue for wildlife management or local communities, if the money actually gets into the hands of the government or local communities," Sutton said. "In many cases, it does not." Sutton points to Cecil’s death in Zimbabwe as a recent example of how legitimate trophy hunting could lead to unethical and illegal behavior. "Most Americans don’t have a problem with hunting for food, hunting for sport," Sutton said. "It’s hunting for ego and hunting for trophies that have far less support among the general public." Cecil was the subject of ongoing research at Oxford University and was collared so scientists could track his movements. The lion was also a favorite among tourists at Zimbabwe’s Hwange National Park. Government authorities have since cleared the Minnesota hunter, Walter Palmer, of any wrong doing, saying he obtained the proper hunting permits to kill the lion. However, Palmer’s Zimbabwean hunting guide, Theo Bronkhorst, is still accused of illegally luring Cecil out of the wildlife refuge and is scheduled to stand trial in Zimbabwe later this month. With society becoming increasingly urbanized and communities now experiencing fewer encounters with wildlife, Sutton said every effort needs to be made to preserve America’s outdoor tradition. "I want to see the future of hunting and fishing in this country secured," Sutton said. "If trophy hunting has to be limited to prevent damage to the reputation of all hunting, I think that might be a price we need to pay."